Just crazy. Rodney's Epsom seat is the only reason any of them are there so it would be an own goal of obliteration should any leadership coup have been successful. Someone's gone and spilled the beans about the depth of discontent in the usually more disciplined and discreet party - which is not a good look, especially at the time of year when politicians stalk off to brood and get drunk go on holiday. Succession planning is one thing, but the revelations from the press gallery are of another order. Young says there was an opportunist coup afoot when Rodney was at his most vulnerable. It is silly on so many levels. 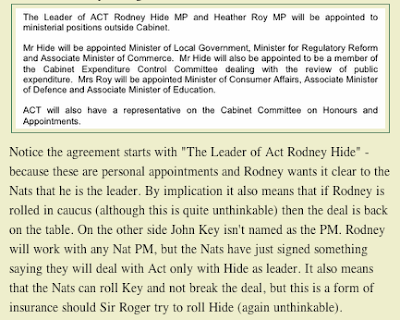 The party support arrangements that formed the government last year were quite clear: the deal is with National and Rodney as the leader of Act. National are free to change their leader and that will not alter the agreement with Act (or the Maori Party for that matter), but it is not true the other way around. 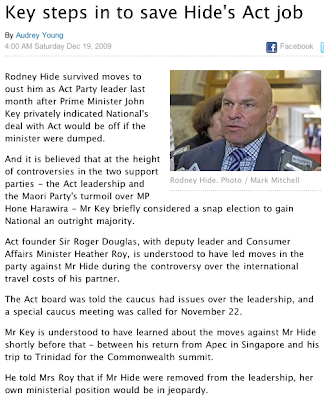 If Rodney gets deposed as Act leader then the deal is broken and must be renegotiated. As I noted at the time this puts Rodney in a very strong position: Unthinkable? That's our Roger. I wish they did roll him. About time those out of touch wankers got lost.